A head-mounted display , both abbreviated HMD, is a display device, worn on the head or as part of a helmet, that has a small display optic in front of one or each eye . A head-mounted display (or helmet-mounted display, for aviation applications), both abbreviated HMD, is a display device, worn on the head or as part of a helmet, that has a small display optic in front of one (monocular HMD) or each eye (binocular HMD). There is also an optical head-mounted display (OHMD), which is a wearable display that can reflect projected images and allows a user to see through it. A binocular head-mounted display (HMD). 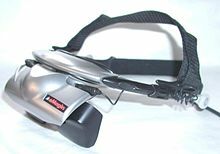 A professional head-mounted display (HMD). A man controls Google Glass, a type of optical head-mounted display, using the touchpad built into the side of the device. The Oculus Rift virtual reality headset.